Premier Houseboats are pleased to present Beatrice, a Sole Bay Ketch, one of only three made to this specification, currently on a residential mooring and in good working order. Beatrice is solidly built of Iroko on Oak frames, and was last out of the water in 2015. She has a Perkins 6354 120 hp diesel engine which can provide plenty of power when required, and comes with staysail, jib, mainsail and mizzen. 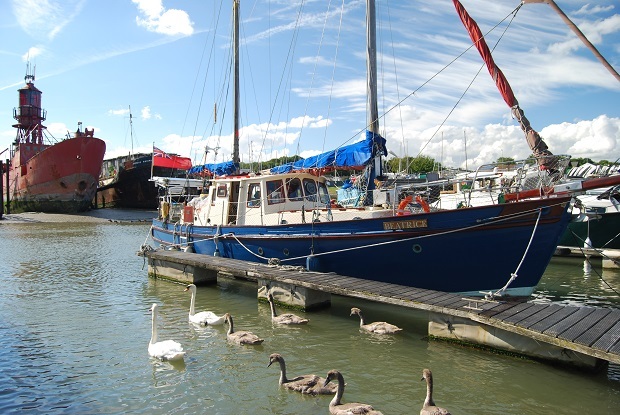 Beatrice offers comfortable accommodation whether moored or sailing, and is fitted out in a traditional way. There is a good sized aft cabin that has a double and single berth, and plenty of storage. The wheelhouse/cockpit area is a good navigational point as well as a nice area to sit and enjoy your surroundings. Down a small set of steps is the main saloon with a separate toilet and shower room. The saloon itself is a comfortable size, again with a traditional fit out, built in seating and storage, and a Dickinson diesel stove. The galley has cooker, fridge and freezer, together with more storage and sink. Forward from the kitchen is a second cabin with two single berths. Externally there is good deck space, and there are solar panels a wind generator, both of which can supply electricity. The sole Bay is a well thought of make, traditional and well built, and can be a full time home, part time home or a leisure craft. Vessel name: Beatrice Vessel condition: good Designer: J Francis Jones Builder: Gordon Armstrong marine Make: Sole Bay Model: 40 Year constructed: 1966 Berths: 5 Cabins: 2 Heads: 1 No. of engines: 1 Length over all: 50' Length of deck: 40' 6" Beam: 12' Maximum draft: 5' Disclaimer Premier Houseboats offers the details of this advert in good faith as it was presented by the seller or his representative but cannot guarantee or warrant the accuracy of this information nor warrant the condition of the described item within this advert. A buyer should instruct his agents, or his surveyors, to investigate such details as the buyer desires validated. The Item described within this advert is offered subject to prior sale, price change, or withdrawal without notice.